I think we can all agree that a fresh loaf of bread straight from the oven is thing of joy, right? And we can probably also reach consensus on the fact that soft pretzels are one of life’s great pleasures. Pretzel rolls? Delicious, too. Now how about we combine all of that in one perfect, lovely, tempting, chewy yet tender loaf of deep, dark brown Pretzel Bread sprinkled with coarse salt? I think that a giant loaf of soft Pretzel Bread is something I had no idea I needed until I made it. We are talking about eating happiness. Mercy. Imagine eating a fried egg sandwich or grilled cheese on toasted Pretzel Bread. How about a Pretzel Bread roast beef sandwich? Perhaps you’d prefer a wedge of pretzel bread to dunk into broccoli cheddar soup or slow-cooker beef stew with bacon. All of those are good. I won’t lie, though… I’ve cut a slab straight from the loaf and simply dropped it into a frying pan over a melted pat of butter and let it brown up a little on just one side. 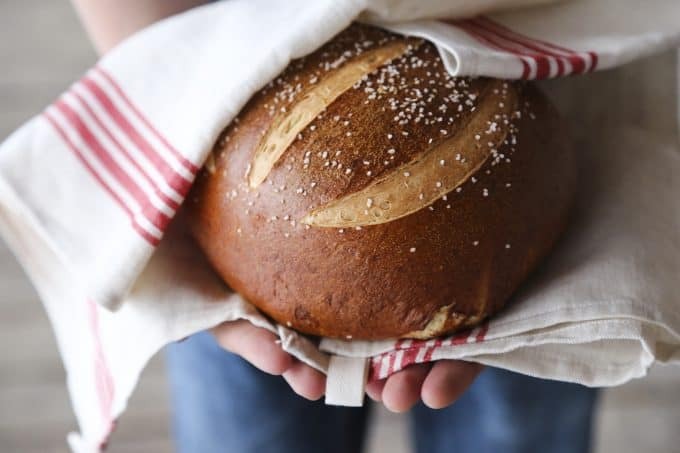 Crunching through that crispy, buttery, toasted side into the perfect crumb of the pretzel bread and finding that chewy bit of crust studded with pretzel salt on the side is reason enough to make the bread. Everything else is gravy, friends. 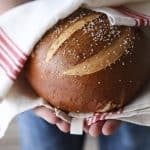 Forming the loaf is not difficult, but it is a slightly different process than your average sandwich bread. After the initial rise, you will turn the dough out onto the counter. Lift the dough and stretch one quarter of it down around the edge of the dough wad toward the bottom. Turn the dough a quarter turn and do the same thing. Repeat this until you have a smooth-ish ball. Place the ball on the counter or dough mat and rotate the dough ball in one direction, using the edges your hands at an angle to ease the dough into a tighter and tighter ball. The dough ball should be covered by a smooth, tight surface. At this point, place it on your silpat or non-stick foil coated pan and cover lightly with a damp tea towel to rise a second time. I’ve made you a video to help! Please note that the video features a double batch of dough. This means that if prepared as directed in the recipe, you’ll only have to shape and boil one loaf. While the dough is rising, preheat the oven to 400°F and prepare your pretzel boil. While using brown sugar isn’t necessarily traditional in pretzel boils, I like to use it because I prefer a darker, shinier crust. It is true that you can get a darker crust with an egg wash, but my fancy turns to the brown sugar crusts these days. It doesn’t really lend sweetness to the crust as much as gives the exterior a little boost of sugar to help with browning in the oven. When it comes to storing your cooled Pretzel Bread, don’t use an airtight bag. While pretzel salt resists melting, it isn’t impervious to it. You want to walk the fine line between leaving it completely exposed to the air which would make it stale too quickly and wrapping it up like a mummy which will trap too much moisture and ruin your lovely crust and possibly melt your salt. How to do this? I prefer a plain old paper grocery bag. Cool the loaf completely to room temperature. This is most easily ascertained by the use of an instant read thermometer. If you don’t have one, you can always just kill it with certainty by letting the loaf cool for several hours at room temperature. When it is completely cool, plunk the loaf into a paper grocery bag and lightly fold the end of the bag under the loaf. Voila. You keep the elements (and counter surfing pets) off of the loaf and still protect it enough to store it for a day or so. P.S. If by some miracle it starts getting stale before you can inhale it, please don’t throw it out. It makes the most magnificent toast or grilled cheese sandwich or croutons. No Pretzel Bread left behind! What's better than a soft pretzel? A bigger soft pretzel... in this case, an entire loaf of soft pretzel bread. In a large mixing bowl, whisk together the flour, salt, sugar, and yeast. Set the whisk aside and switch to a sturdy wooden spoon. Stir in the milk and tap water until a soft dough forms. Turn onto a generously floured surface and knead, adding small amounts of flour as needed to keep the dough from adhering to the counter. You do not want a firm dough… it should be fairly slack, a little tacky and soft, yet smooth. Place dough in a clean bowl, cover with a damp tea towel and set aside to rise in a warm, draft-free place until nearly doubled in bulk and puffy, about an hour or so. In the work-bowl of a stand mixer fitted with a dough hook, combine the flour, salt, sugar, and yeast. Mix on low just to combine dry ingredients. With mixer still on low, carefully pour in the milk and water. Continue mixing on low until you have a smooth, soft, slightly tacky dough. Remove bowl from the mixer, cover with a damp tea towel and set aside to rise in a warm, draft-free place until nearly doubled in bulk and puffy, about an hour or so. Add the milk, water, flour, sugar, and yeast to the pan of your bread machine in the order recommended by the manufacturer. Select the “Dough” or “Dough Only” cycle and hit start. Allow the cycle to complete. Preheat oven to 400°F. Line a baking sheet with a silicone baking mat (a silpat.) or non-stick foil. Turn the dough out onto a clean surface. Lift the dough. Gently pull the edge of the dough down and tuck under. Turn the dough 1/4 turn and repeat. Do this until you've formed a cohesive round. Place the round on the clean surface and use your hands to gently turn and tighten the dough down over the surface. Place on the prepared pan, cover with a clean tea towel, and allow to rise while the oven preheats. Bring 2 quarts of water to a boil in a stainless steel or other non-reactive pan (enameled cast-iron, tempered glass, etc…) When water boils, add the brown sugar and baking soda. Gently lift the loaf and ease the dough top side down first into the boiling water. Let simmer for about 3 minutes, flip the dough using two spatulas or slotted spoons and simmer for another 2 minutes. Use two spatulas or slotted spoons to lift the dough out of the water quite carefully and transfer back over to the silpat or nonstick foil lined baking sheet. Spritz the bread with water and sprinkle with coarse salt. Use a sharp knife to slice along the contours of the bread about 1/4-inch thick. Place the pan in oven and bake 35 minutes or until deep brown and at least 185F in the center of the loaf according to an instant read thermometer. If you want a crustier loaf, let the internal temperature rise to 205F. Transfer the baked bread to a cooling rack and let it cool completely before slicing. Yes – Pretzel Bread croutons for soup! Love that idea! This idea totally makes sense to me!! So delicious! I’m already obsessed with this bread and I haven’t even made it yet or tasted it. love!!! All kinds of YES. Soft pretzels are my weakness, pretzel rolls, pretzel bread: ALL of it. This, my friend, looks incredible and I can’t wait to give it a go! Ok, looks yummy, but where in that are we shaping the loaves? Before or after the hour rise? Thank you for the heads up, Ruth! I backspaced through those instructions. They’ve been added back in. Form the dough after the first rise. I’d love to make a big ham sandwich with spicy brown mustard on that bread! Any specific reason to use a sheet pan? Would it work on a pizza stone? Looking forward to trying it this weekend. Hi Mike- The reason I use a silpat lined sheet pan is that when I make smaller soft pretzels, the boiled dough has a distressing tendency to adhere to the pan if it is not lined with a silpat. I imagine it would work well if the peel/pizza stone are well dusted with cornmeal. That being said, I haven’t tried it! First, thanks for this recipe. It’s as insanely addictive as advertised. Just to follow up, the parchment/pizza stone worked out well. No issues. 2. The second time, I used flour on my hands a very small amount (maybe 1/2 tsp) when I was shaping, made handling the dough initially much easier for the quarter turns. 3. The first time, my dough sank to the bottom of the pot and stuck a bit. Not sure if the water wasn’t boiling enough or there wasn’t enough water or what. Second time, I split the single recipe into two smaller dough balls and increased the water another cup and really got a rolling boil going before dropping in. No issues, nice and floaty. 4. Maybe it takes some practice, but still have not achieved that smooth crust after baking you’ve got in the photo. I got (what I thought) was a good tight skin on the second attempt, but the boiling step still pocked up the dough. Still, an ugly pretzel loaf doesn’t last any longer in my house! Well to be honest, the first time I missed the second rise bit, so it only probably sat 5 minutes as I waited for water to boil. This is the one that used the full dough and sunk and stuck, tho the water was not rapidly boiling. The second time, I did see the second rise instructions and it sat out, divided, for 30 minutes while oven pre-heated and water (this time 3 quarts) boiled. I did put it down dome first, but results were essentially the same both times. Maybe just got to work on getting that cloak tighter. I thought it was pretty good. I’m not new to bread baking so I knew what you were going for. Either way, great recipe and my slightly ugly loaves still taste great. I love pretzel bread! I’m so glad you shared this…I would never have attempted it otherwise! Great looking loaf of bread. A goal this year is to learn to bake beautiful bread such as this! Love you little video too. I just made a half batch of the pretzel bread and it turned out beautifully! Hi.. I bake a lot of bread. I always use parchment, but I figured boiling the bread would set the bottom crust and it wouldn’t stick.. but it stuck 🙁 the bread is awesome in all other ways.. I want to make another loaf right now but Im out of milk so tomorrow.. great recipe but no tinfoil or spay the tinfoil.. maybe some cornmeal too on the pan..
Cornmeal is a great option on the pan if you’re finding that your dough sticks. Boiling certainly sets the bottom crust, but it also makes the bottom crust tacky. Some brands of parchment or non-stick foil work better than others, but cornmeal would be a great equalizer. Does this require active dry yeast, bread machine yeast, or rapid rise? I would use active dry yeast or bread machine yeast! The bottom of the loaf was gooey, probably due to water trapped underneath during baking. How can I a void this in the future. Also, the loaf really expanded outward. Was it not rounded enough? It was about 8″ or so in diameter. This is a delicious bread recipe. I couldn’t resist making it healthier by substituting 1 cup of whole wheat flour for 1 cup of bread flour. I also added 1/2 cup of wheat bran. I’m having a problem with my loaves splitting. I’m putting 3 deep slices to try to prevent the splitting, not working. I’m using a lye bath, not simmering in baking soda, sugar mix. Hi Lisa- I’m afraid I’m not sure what to tell you. Maybe you’re over proving the dough a bit? That sometimes does it. That said, I also don’t use a lye bath, so I don’t know if that contributes. Anyone who has ever made pretzel bread knows you don’t let it rise a second time or you won’t get the right texture. And anyone who has made this pretzel bread knows it’s delicious. 🙂 Besides, that second rise is only for however long it takes to preheat your oven. Mine takes 10 minutes, tops. Make this bread!!! It is amazing and not hard to make. I’m glad you loved it, Nancy! !